Chef Eric Mickle has added his touch to the Orange Hill menu and we couldn't be happier! "Orange Hill Restaurant, a hilltop venue in Orange, is adding several new dishes to its tried-and-true steak and seafood menu under new chef Eric Mickle." 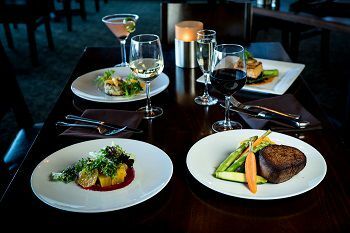 "A few new dishes debuting Tuesday include barbecue duck tacos, French onion soup served with Gruyere grilled cheese sandwich, Kurobuta pork chop, skirt steak, roasted Jidori chicken, seared scallops, grilled Skuna Bay salmon and winter squash risotto."